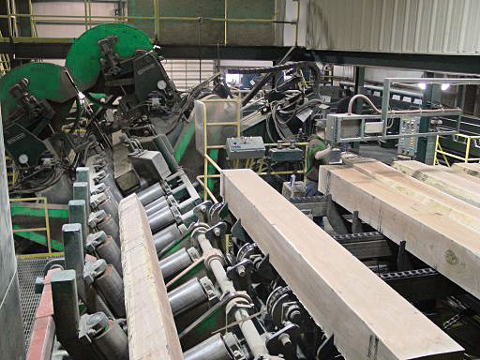 A sawmill superintendent was struck by a piece of lumber while standing at the end of a re-saw line. The mill superintendent was examining the wood coming out of the re-saw when a 4.9 m (16 feet) piece of lumber jammed in the machine. The piece of lumber suddenly flew out, striking the man in the abdomen and knocking him back 1.5 m (5 feet). He got back up, assured those around him that he was fine, and returned to his office. He went home early that evening but later that night was admitted to hospital for emergency surgery where he died from his injuries. Provide adequate guarding along conveyors from edger to re-saw and at any location beyond, where any employees work or travel. Ensure that someone trained in first aid is readily available to assess employees who are injured. Even if employees say they are fine, they must be transported immediately to a hospital for further examination following any traumatic blows.